Saturday 15th October from 1 pm at the BikeLights site. Come and join artist Alessandra Ausenda to decorate your walker or scooter with lights for BikeLights this year. 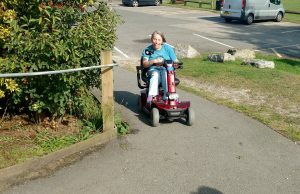 Bring your own scooter or borrow one from Concern Wadebridge. Claire testing the awkward slope at Anneka’s!